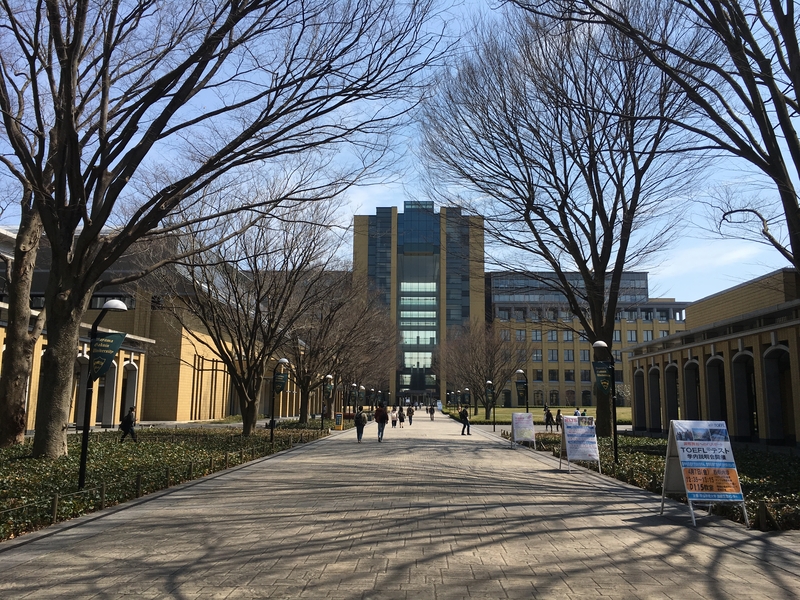 Wednesday, April 12: I’ve almost finished my first full week of teaching with Westgate Corporation at Aoyama Gakuin University Sagamihara Campus. My employer is actually Westgate, and they hire us out to the university. 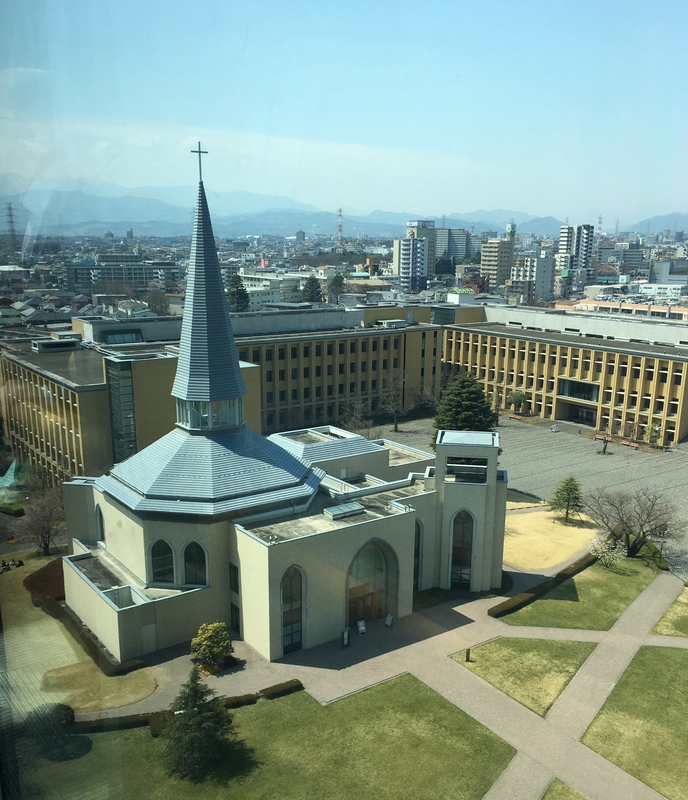 The university’s program is a two-year program within the School of Global Studies and Collaboration; I teach second year students who will be going on a study abroad in the fall semester to either Malaysia or Thailand. We’re supposed to help them improve their English skills for their study abroad program; this program is meant to enhance their understanding of different cultures. 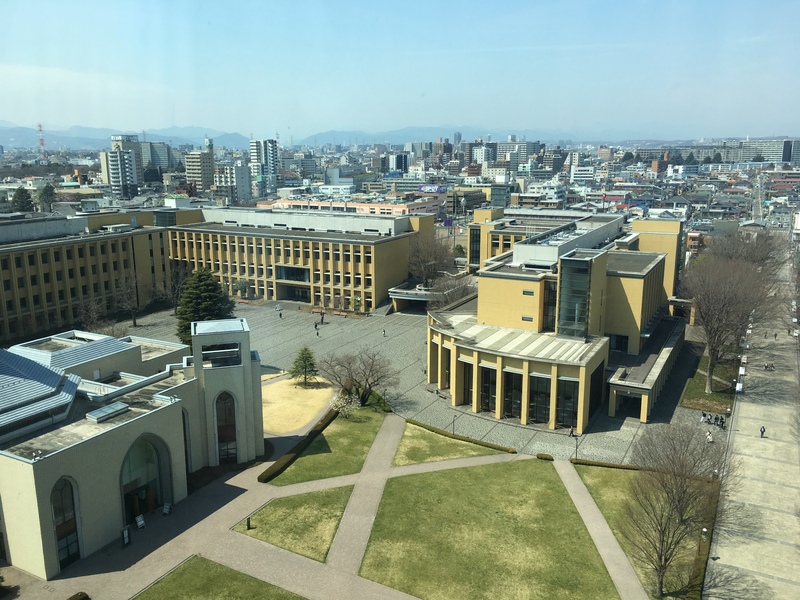 Here are some pictures of the campus. 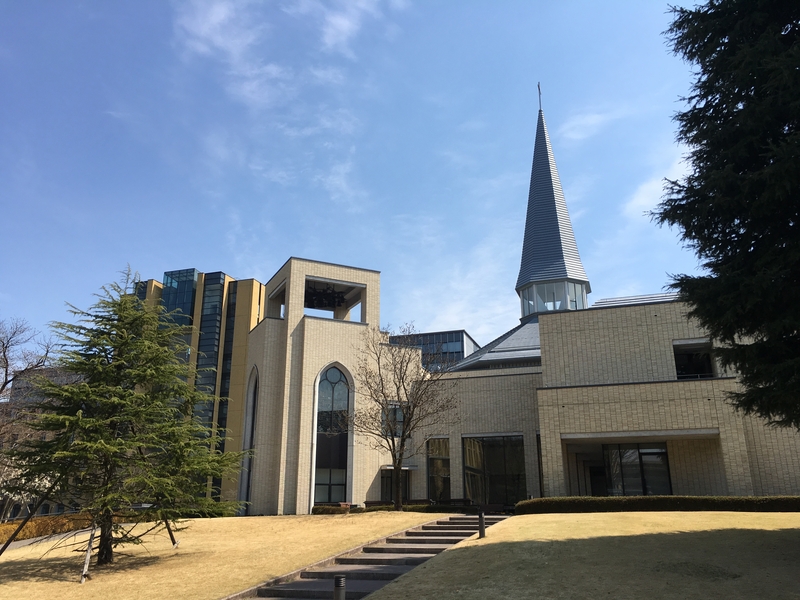 According to the university website, the university was founded in 1949, offering an education in line with “the founding spirit” based on the Christian faith. The aim is to nurture individuals with a strong sense of social responsibility and morality to contribute to ever-changing society. 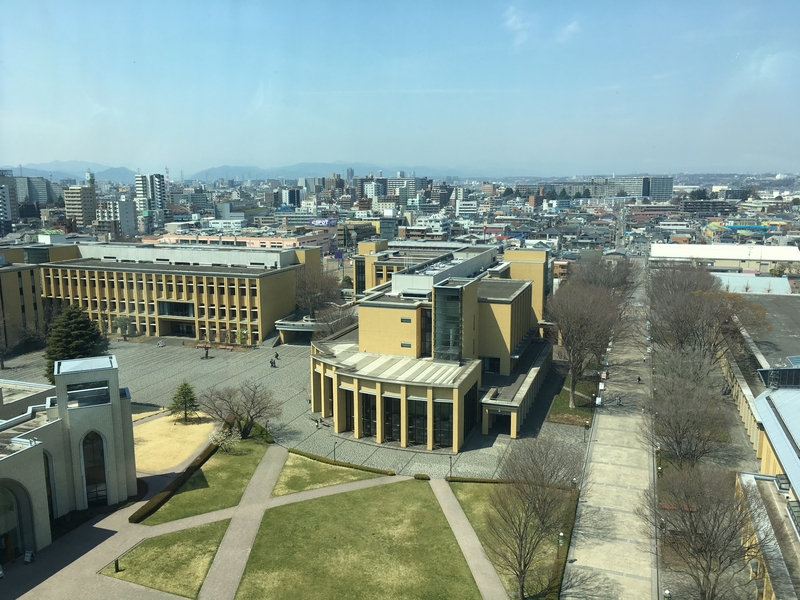 The university is also strongly committed to language education and international exchange to promote international understanding. 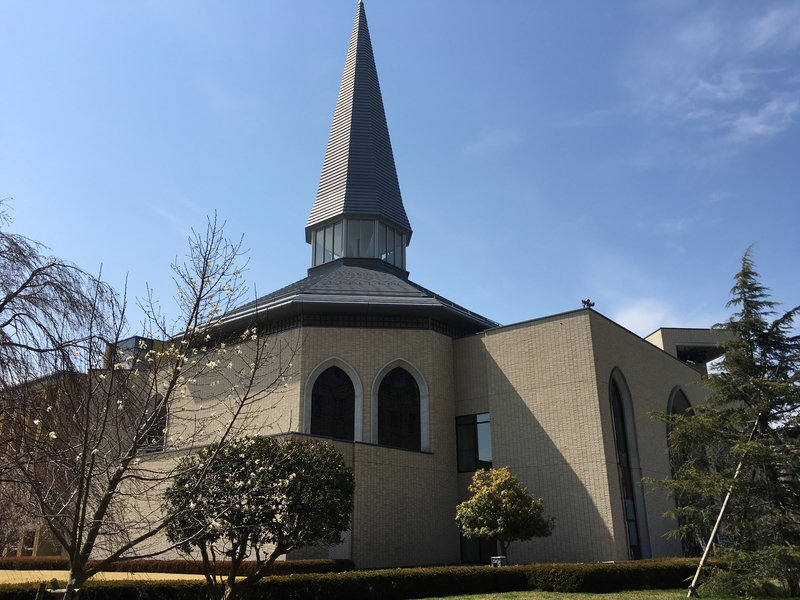 Though the university was founded by the Methodist Episcopal Church, and there is a chapel on campus, neither students nor faculty are actually required to be of the Christian faith. 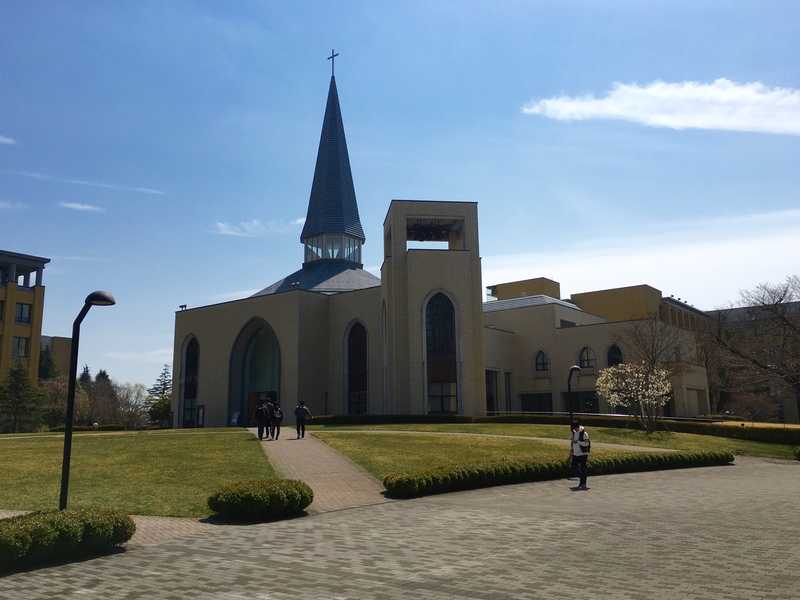 However, we can hear church music and bells on campus, and students have a special chapel time set aside each day. 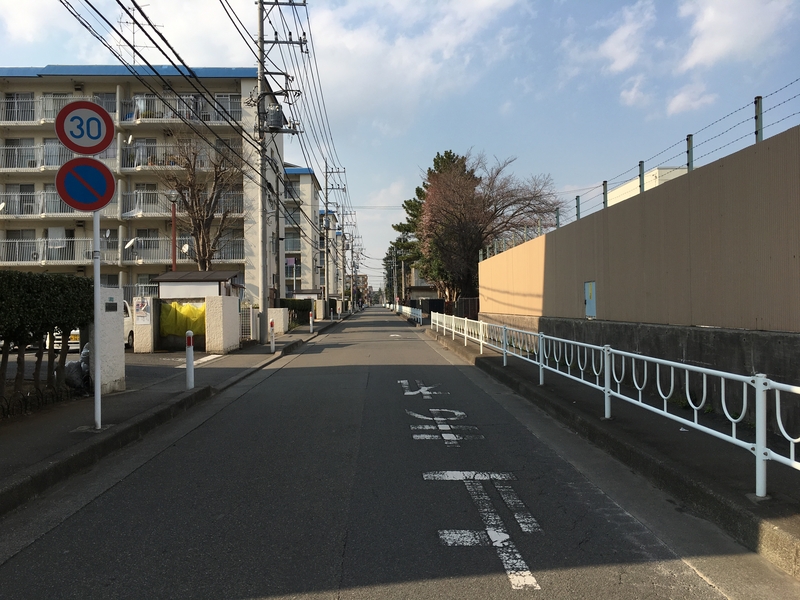 Our teacher office is in the building on the right in the photo below, and the huge cafeteria is on the left. Bento boxes are offered by kiosks, prepared meals are sold in the 7-11 on-site, and hot meals are sold in the sprawling cafeteria. 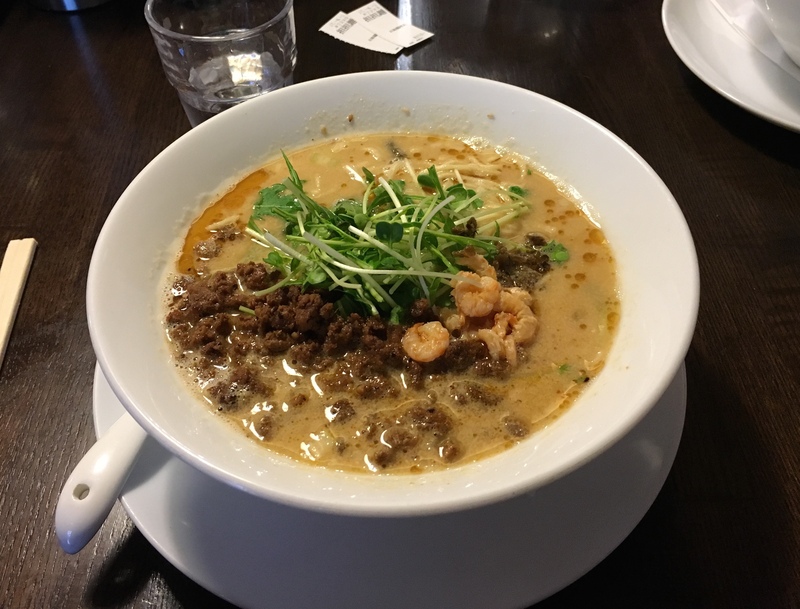 There are displays of the food, and machines that list the price and the dish in Japanese (machines on one wall name them in English, thank goodness). 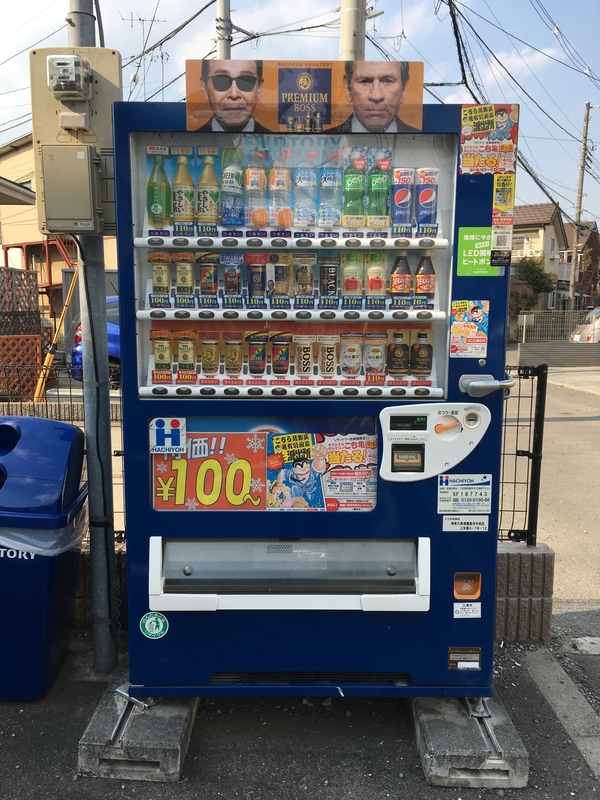 You push a button on the machine, put in your Yen, and then collect a ticket. At the back, you take your ticket to one of the serving stations depending on what you ordered: a station for udon, ramen, soba, fish or chicken dinner, etc. You then stand in line, hand your ticket to the ladies behind the counter, and they serve you up! I have three classes of 18-20 students, 56 students altogether. I teach all three classes for 90 minutes each on Monday, Thursday and Friday; on Tuesday and Wednesday, the three classes are spread out over two days, giving us some planning time. I plan four classes a week (repeating the lesson for each of my three classes). I work 9:30-6;30 on M-W-F and 8:40-5:40 on Tu-Th. 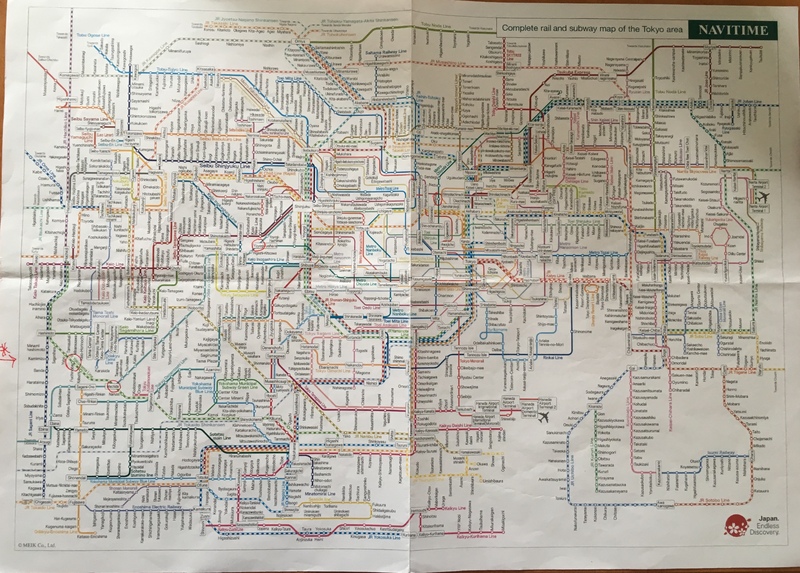 If it seems confusing, you’re right, it is. I have to keep referring to my schedule to see when I work and where I go to teach and which classes I have. But, that is always the nature of teaching. So far my students are a pleasure and seem eager to improve their English for their upcoming study abroad. 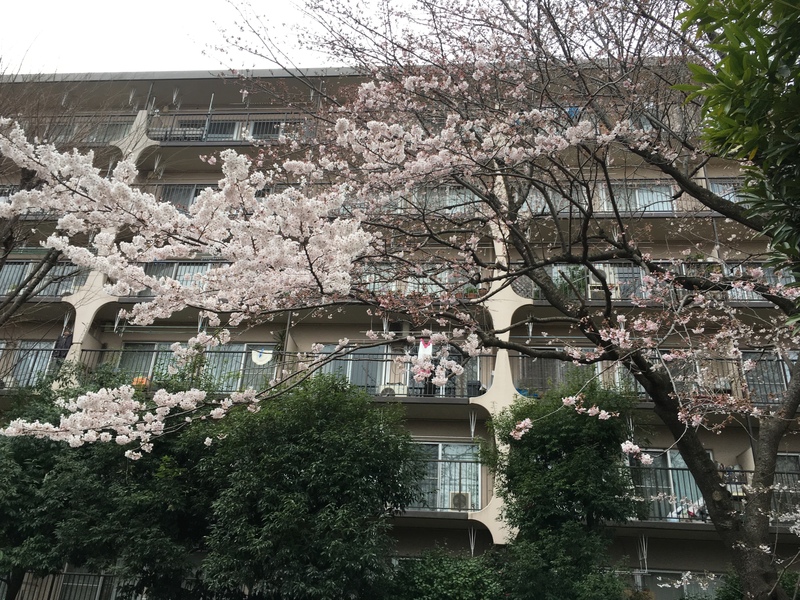 Wednesday, April 12: I live in a small apartment owned by Leopalace in Sagamihara, Kanagawa Prefecture; my building is a 20-minute walk from the Fuchinobe metro stop on the JR Yokohama Line and a 30-minute walk from the university where I teach 9 hours/day Monday-Friday. I’ve been now experimenting with various coffee options since we don’t have any kind of coffee-maker or kettle in our apartments. First, I found small cup-sized paper filters (cone-shaped with flat bottoms) in the supermarket. 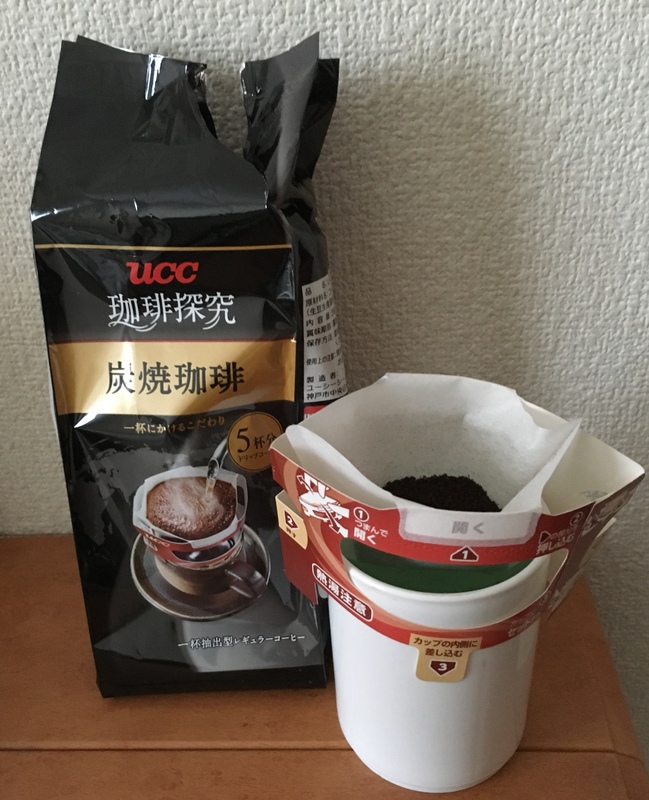 Then I bought some coffee grounds with pictures on the package showing the coffee grounds placed in the filter in the cup and hot water being poured over the grounds. That didn’t work too well, because as soon as I poured the water into the filter, the filter, weighed down by the water and the grounds, sank to the bottom of the cup, making for a murky, ground-filled cup of coffee. That certainly wasn’t a good option. Next, I bought a small jar of instant coffee. I drank instant coffee constantly in China, Korea and Oman, so I’m used to it. However, for some reason, the instant coffee grounds didn’t totally dissolve. It’s Nescafé and the grounds are finer than the other grounds I bought, but since the jar’s contents are written in Japanese, I’m not sure it is instant coffee. I love living in a new culture because even the most mundane things, like figuring out how to drink coffee, are adventures. Everyday life is far from monotonous. Below is the view of my top floor corner apartment, #201, from the vending machine. My apartment is the top corner one on the right from this vantage point, which is on the other side of the building. 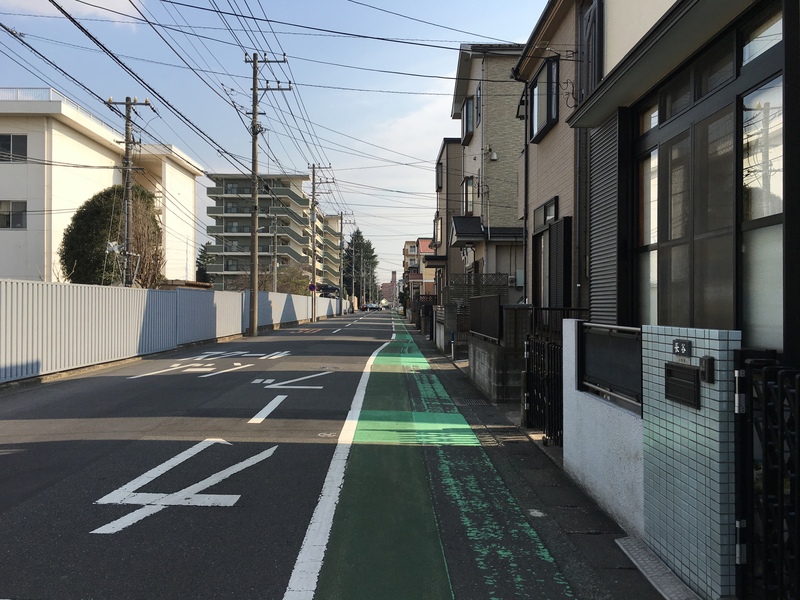 I love my Japanese neighborhood. 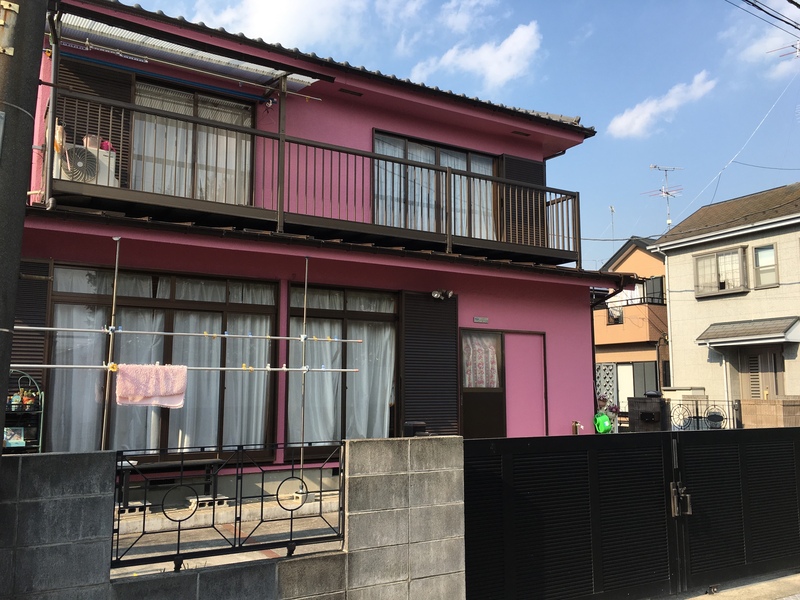 The houses are compact with tiny carports or little garages housing colorful compact carts. 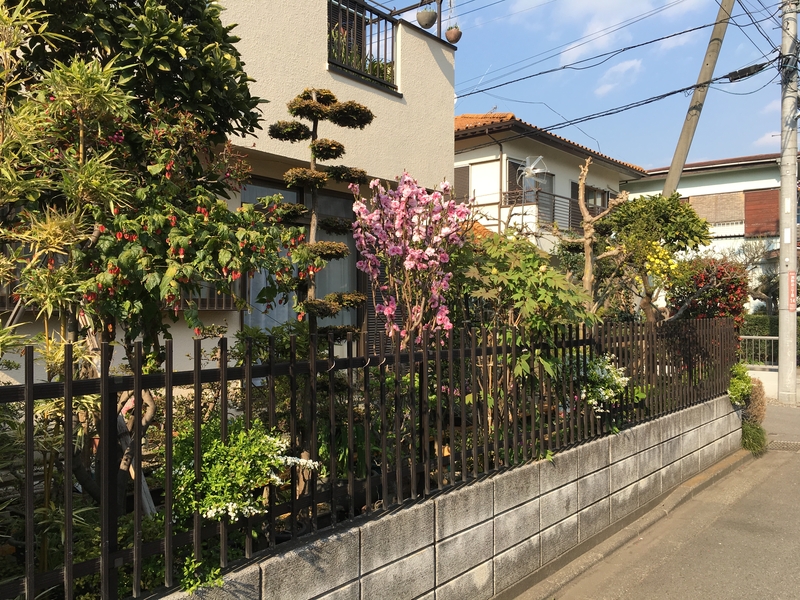 Many neighbors have created beautiful gardens in their postage stamp-sized yards; some of these container gardens spill out into the street, giving pleasure to passers-by. 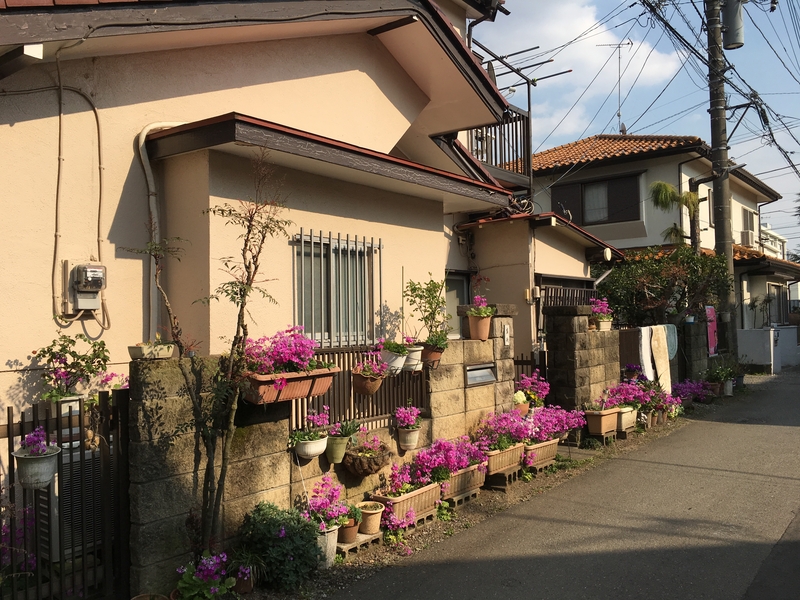 I am surprised to find a few brightly colored houses interspersed with the brown, gray and white ones. 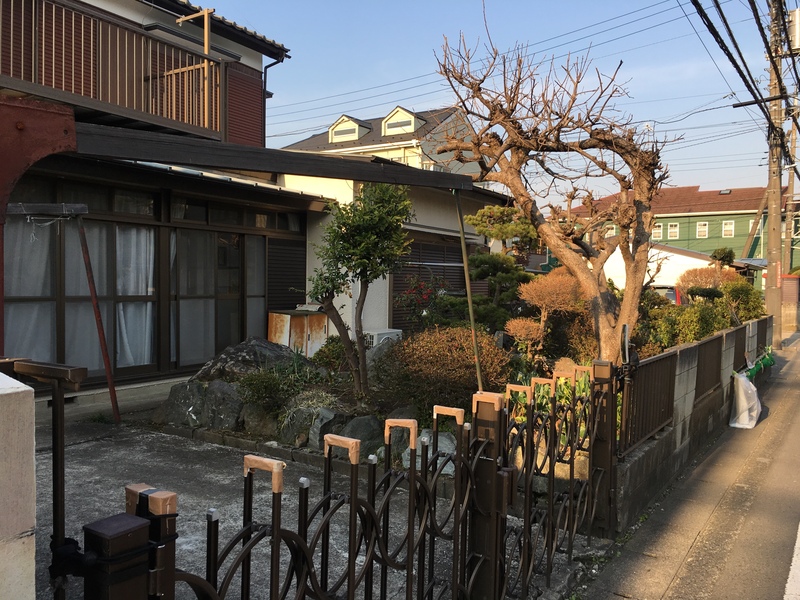 The trees in people’s yards are often either trained into bonsai shapes or trimmed into ovals, cylinders or balls. This is one of my long stretches on my walk into town. Closer to town, I find some cute little bakeries and cafes. I haven’t yet tried them out, but I will do so soon. Last Tuesday at this spot, I heard three fighter jets roaring overhead and of course the first thing I thought of was North Korea. I couldn’t find anything special in the news about N.K. though. 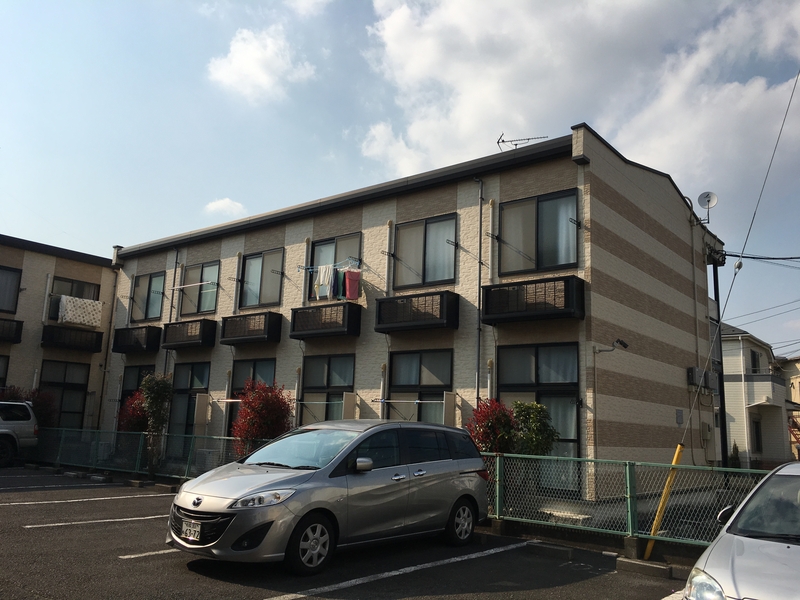 Back closer to my apartment, about 1 1/2 blocks away from home, is our friendly Seven & I Holdings: 7i – which of course, we simply call 7-11. 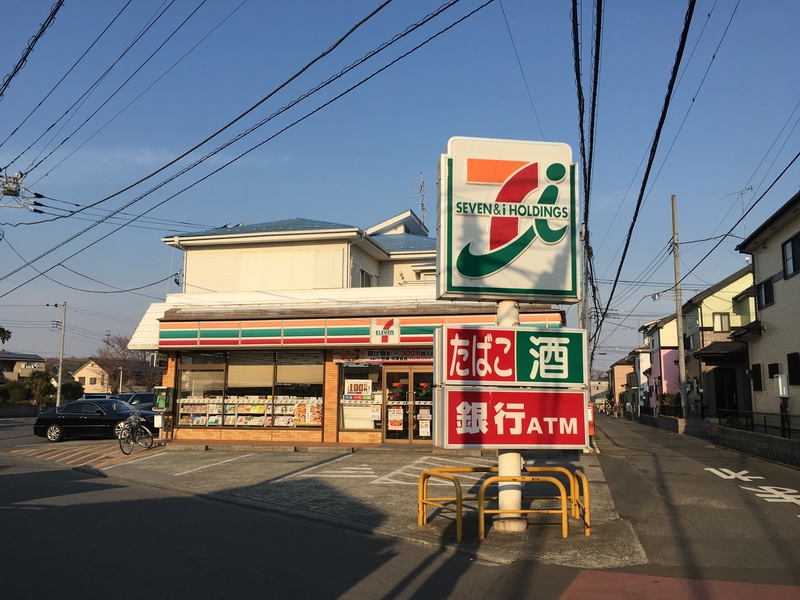 I didn’t know this but according to Wikipedia, Seven & I Holdings was established on September 1, 2005 as the parent company of the 7-Eleven Japan chain of convenience stores, the Ito-Yokado grocery and clothing stores, and the Denny’s Japan family restaurants. In November 2005, it completed the purchase of US-based 7-Eleven Inc. So they are the same, and all owned by a Japanese company. A 7-11 in Japan is much like Wawa in the U.S. Every day the shelves are filled with freshly prepared boxed Japanese meals, arranged prettily in plastic containers. You can get almost anything here. Too many nights, I’ve eaten dinner picked right off these shelves, and they’ve been quite tasty. 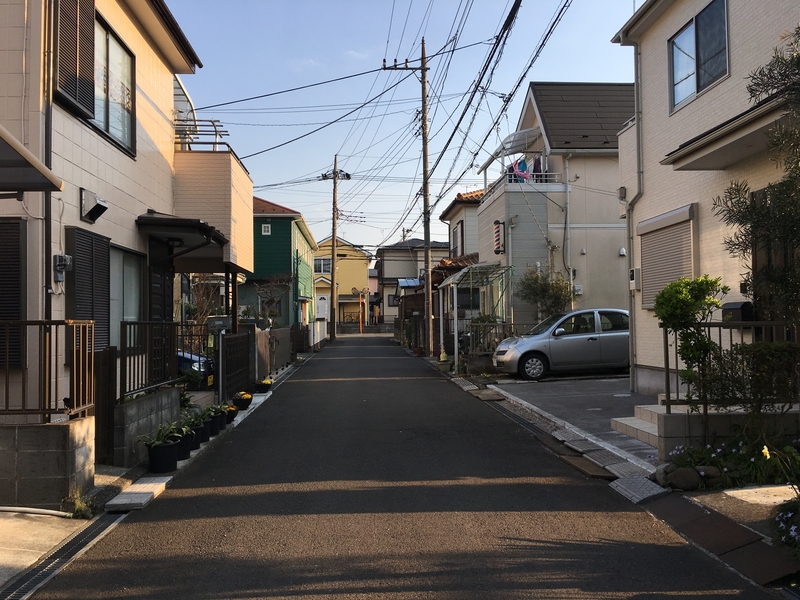 Here are a few other narrow streets in our neighborhood. 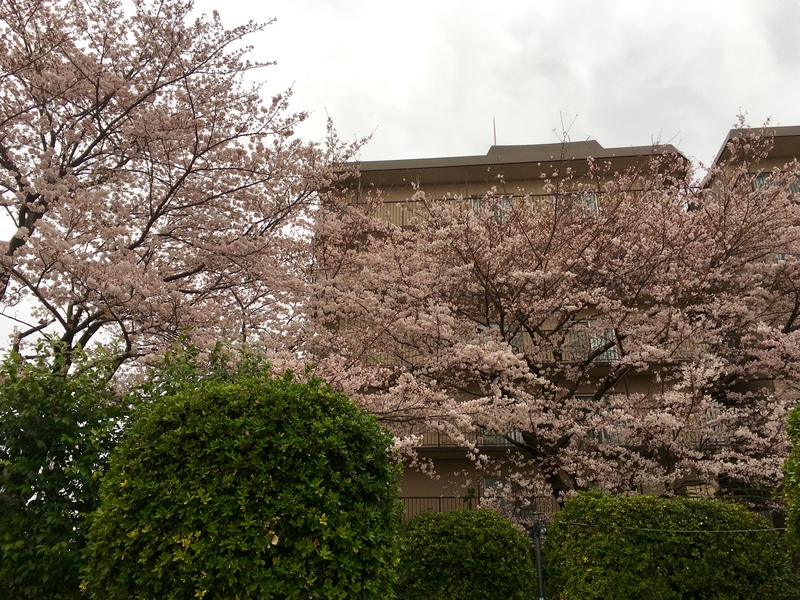 We even have some cherry blossoms blooming near this multi-story apartment building. This past Saturday, when we had a break in the rain, I rode my bicycle to the Gourmet City supermarket to stock up on food for the week. 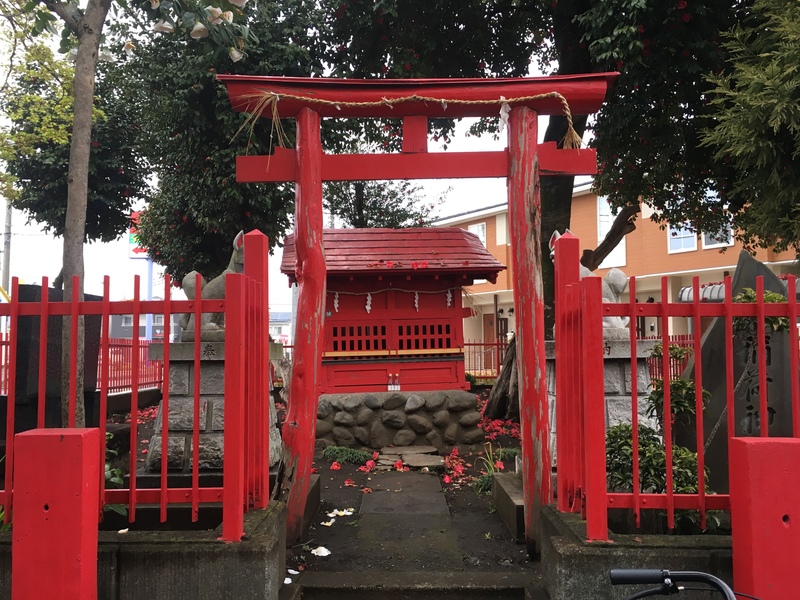 I rode a different route than I normally take and happened upon this cute vermillion shrine. My shiny new blue bicycle is in front. The two guardian dogs seemed quite friendly and didn’t snarl one bit. 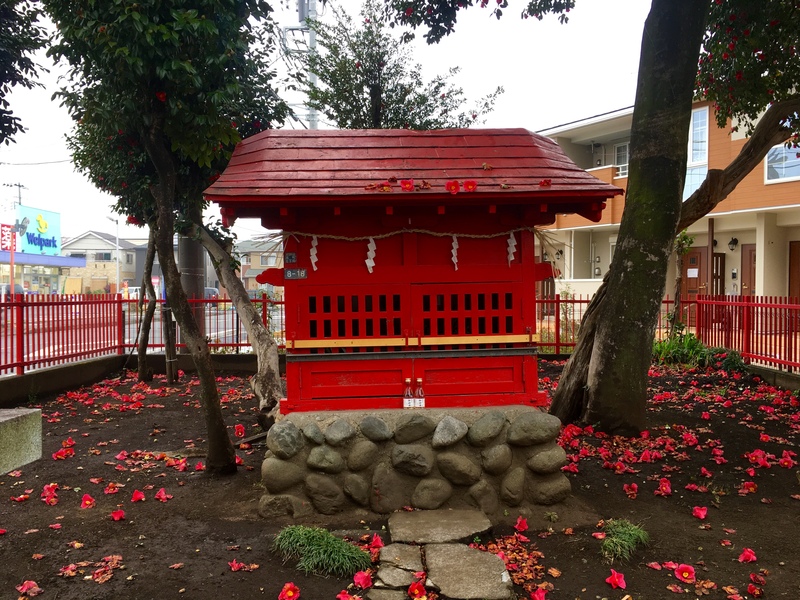 I love this little shrine. 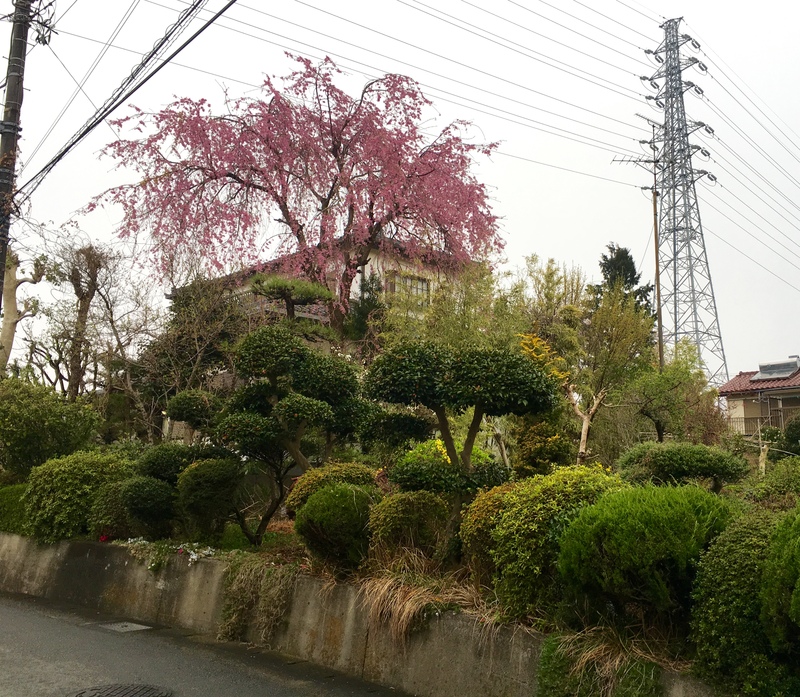 From the vermillion shrine, I took a detour down a side road and found this exuberant garden. 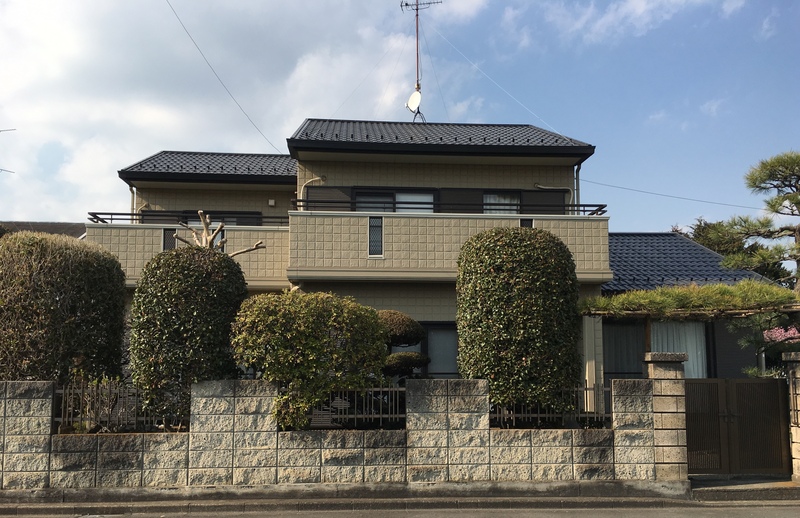 From there, I kept going to a canal with a walking/biking path beside it, and I rode down that for a while, admiring the big houses on a small hill across the canal. 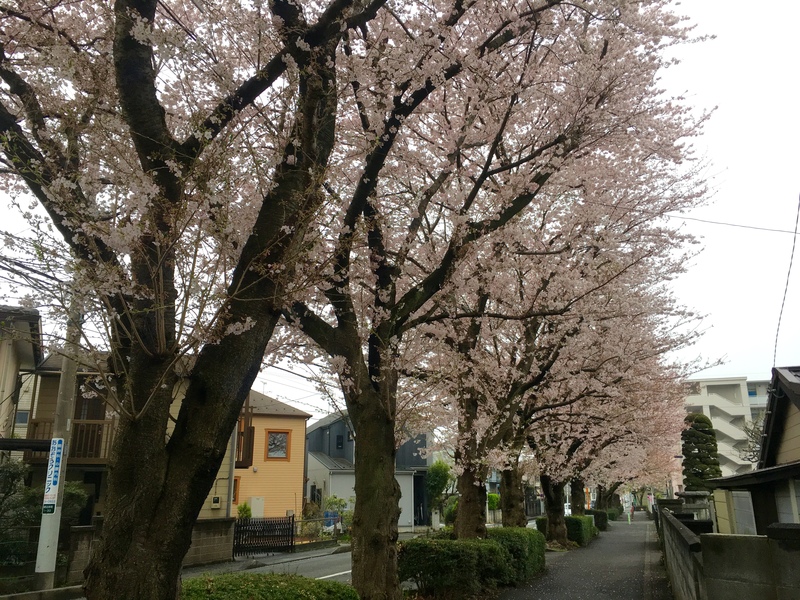 In route to the supermarket, I found this row of cherry blossoms in bloom. 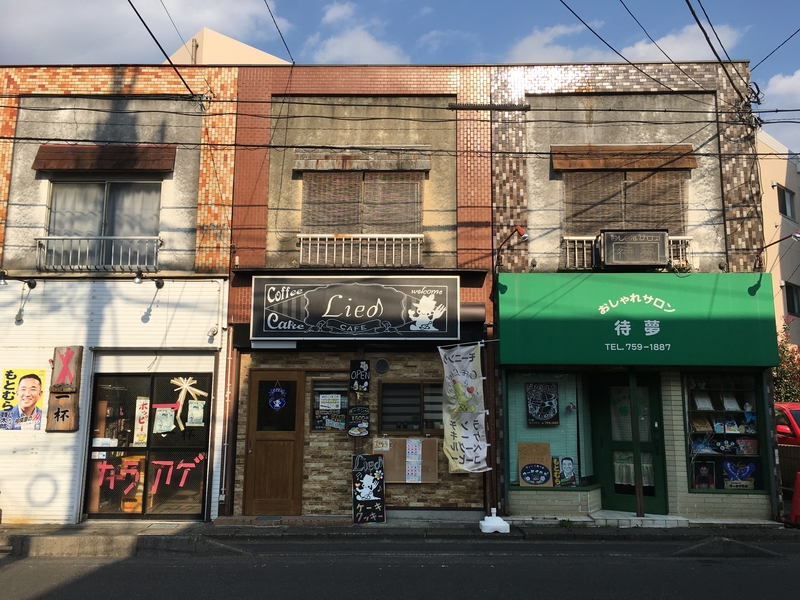 Gourmet City is a good-sized supermarket / 100 Yen store a couple of blocks off our route to the university. I like it because it’s not like the huge multi-story “c-spot superstore.” I don’t enjoy shopping in those huge places that are similar to Wal-Mart or K-Mart. Now that I’ve discovered Gourmet City, I think that’s where I’ll be doing my shopping. Every encounter I have with Japanese salespeople is delightful and bewildering all at the same time. At Gourmet City, I load up a small basket with groceries and place it on the conveyor belt. The Japanese cashier says hello, followed by a string of other words that I can’t understand but sound sweet and friendly. Meanwhile, I’m trying to pull up the simple word for hello, “Konichiwa,” but my brain is so slow that by the time I finally blurt it out, the woman has probably said “hello, how are you today, my children are Tomoko and Nene and they are talented at violin and piano, and I love to do flower arranging and my husband works for one of the big car manufacturers…” My hello comes awkwardly late in the interaction. In the meantime, she is running all my goods over the price reader, chattering the whole time as if it’s the most normal thing in the world that I should understand her. When she finishes, she tells me the amount and I open my purse. The total is 3,684 yen, so I pull out three 1,000 yen notes and then start digging in my change purse for the balance. I can’t tell one coin from the other (10 yen coins look like US pennies and 100 yen coins are like nickels). 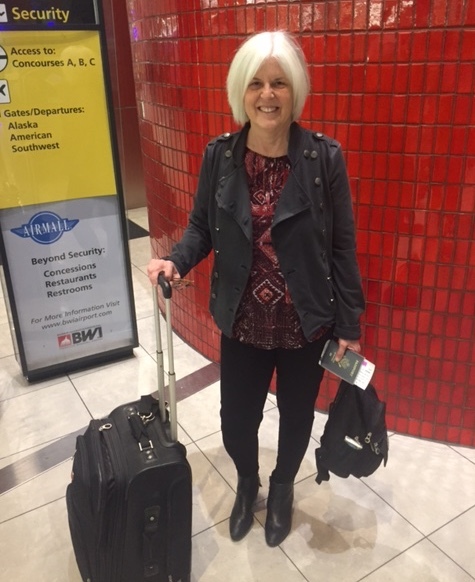 In my confusion, and noticing a line of people growing behind me, I hold out my chain purse to the cashier, and she digs around in there and pulls out the coins she needs. I place my notes and she places my coins on a little tray (I finally figured out I am always supposed to put my money on a tray rather than handing the money to the cashier), and then she takes the money from the tray. After that, I say “Arigato,” and she says “Arigato blah, blah, blah (a lot of other words)” and she bows to me and I bow to her. We bow back and forth several times each, smiling away the whole time. Then she hands me some plastic bags with my basket and directs me to a shelf where I see other people bagging their own groceries. 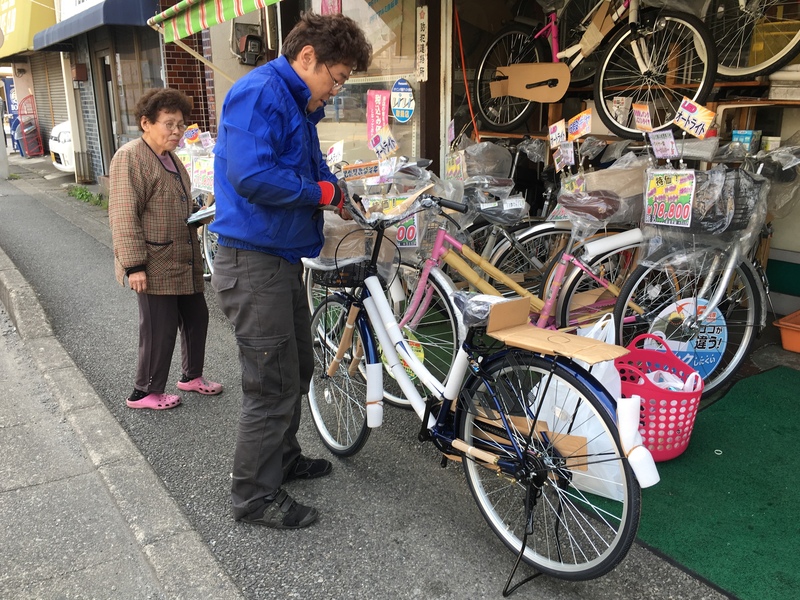 I bag my groceries and leave, loading up my bicycle with the bags, and ride speedily home. I love all the bowing. It sometimes goes on so many times I lose count. I bow, they bow back, I bow again, they bow back. Japanese interactions are one huge bow-fest! This always makes me smile because it all seems so respectful, quirky and charming. 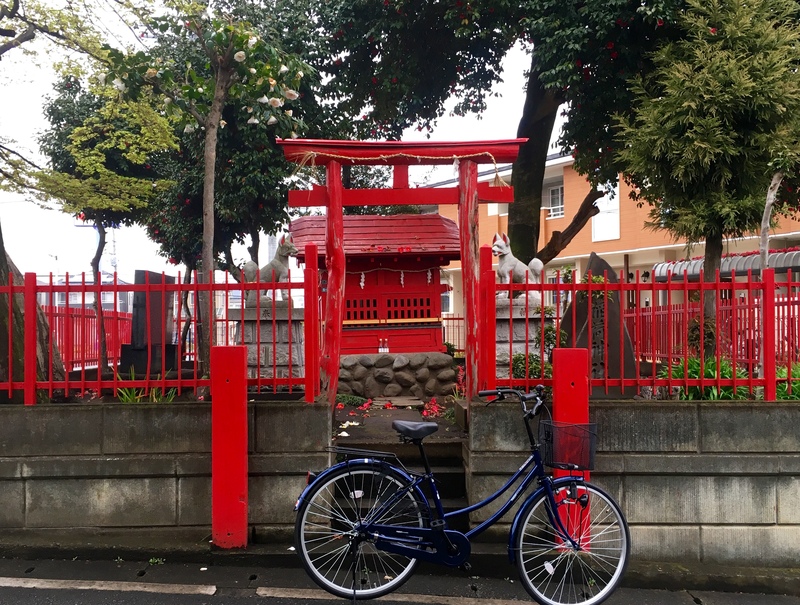 I’m enjoying my sprawling yet homey neighborhood with its: neat narrow streets; cute homes with flower and container gardens, rock features, and bonsai trees; compact cars squeezed into compact carports; cherry blossoms; tiny vermillion shrine; and trusty vending machines and 7-11. I’m also getting used to the complicated trash and recyclable collection days: Monday and Thursday for burnables and non-burnables, Tuesday for plastic bottles, cans and containers, and Friday for cans. This morning I left my house at 7:45; we start early on Tuesdays and Thursdays, so this was my first day to leave so early. 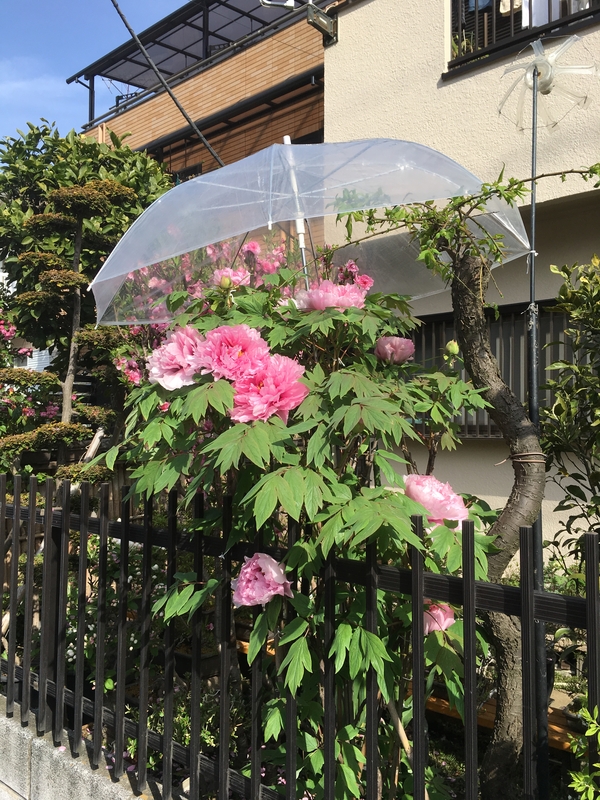 All along my route to school were Japanese schoolchildren walking in orderly lines to school, wearing colorful galoshes, carrying umbrellas with heart and flower patterns, and lugging huge mailbox-shaped backpacks on their backs. Each line was led by an adult. At first I was surprised, thinking they were going somewhere with their teachers, possibly on a little field trip during the early morning school hours, but it was definitely odd to be doing that at such an early hour. I wondered who formed the lines and where they originated. There were scores of lines converging from all directions, with maybe 10-15 students in each line; like ants on an anthill they scurried along with definite order and purpose. I finally figured out that the lines served the purpose of school buses in the U.S.: one driver – a parent – driving (leading) the children to school, but without the bus.